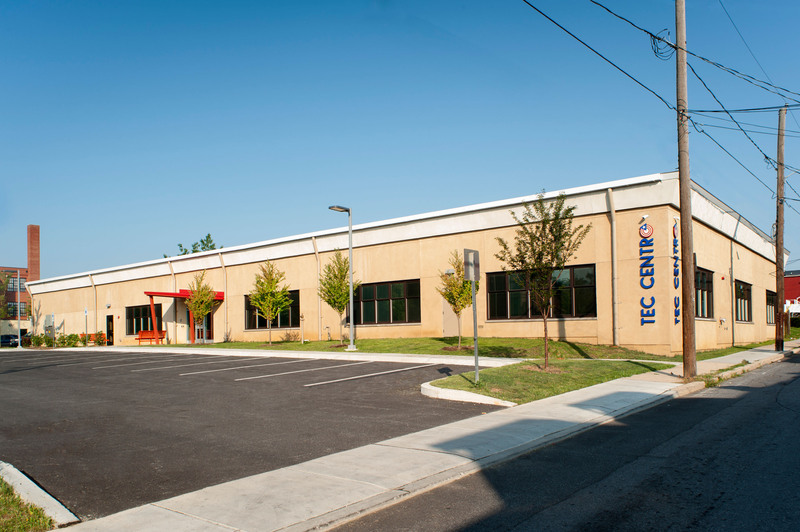 ​In approaching the interior design requirements for the Tec Centro facility, functionality is first and foremost. Elements such as lighting and room layouts facilitate the purpose of each space and provide a comfortable classroom experience. Decor enhances the instructional environments while appealing to the multi-cultural, diverse faculty and students. 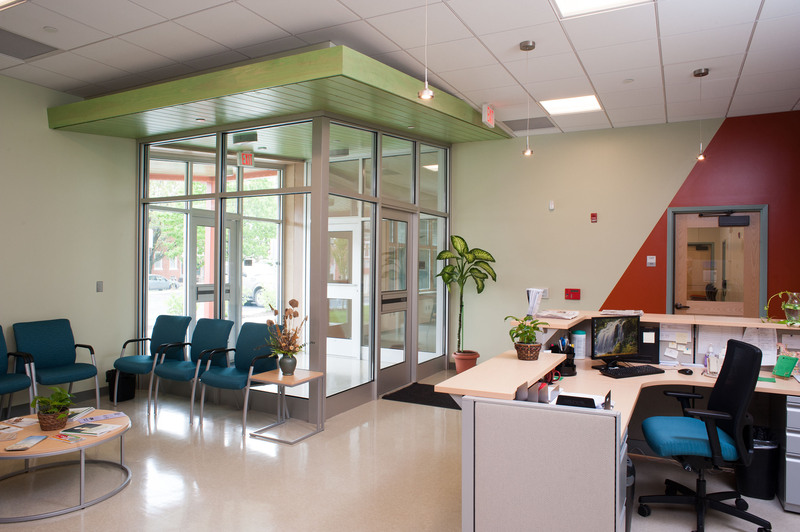 Through interior design we created inviting interiors to inspire students and make the center a place they want to be. 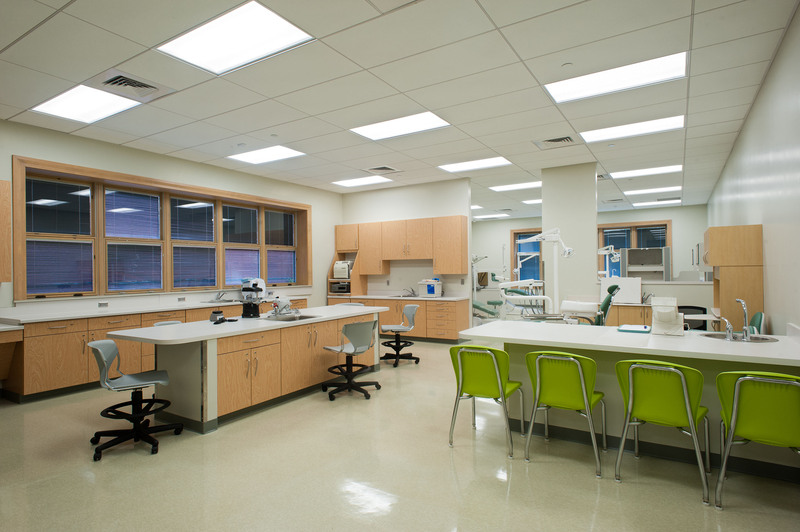 The Dental Assistant Training Suite includes a lab training area (foreground left), dental instruction station (foreground right) and four dental instruction stations for individual student attention. Stations have the same equipment and features commonly found in commercial dentist offices. Colors are neutral and pale, simulating the sanitary requirements for a dental office, with spots of bright color added in chairs and furniture. The sculptural design of the entrance canopy is reintroduced in the walls and ceilings within the building, in both color and shape. Large expanses of glass create a reception and waiting area that is bright and inviting. Shades of green and blue in the accents and furniture introduce soothing nature tones that contract to the bold red of the walls that promise an exciting experience within. The receptionist's desk is in two levels, making it approachable and accessible for all. Furnishings are simple yet comfortable. The space in the Nurses Assistant training room is sectioned into areas by interior design elements. 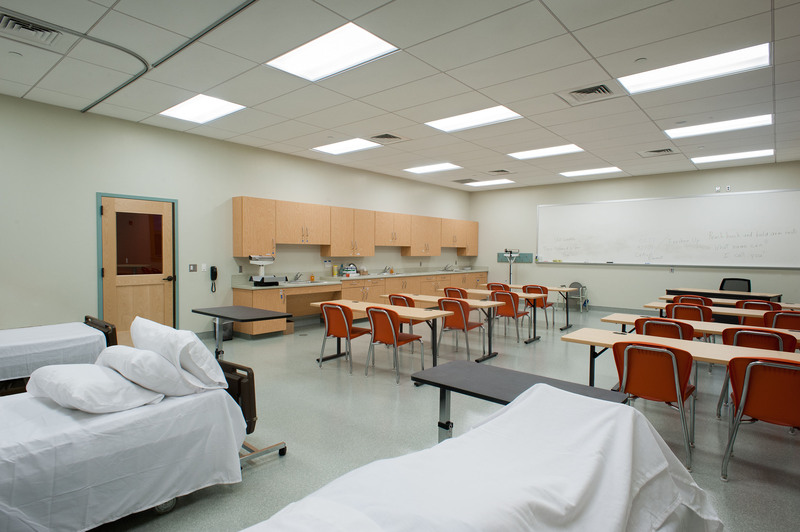 The open room has distinctly different sections for patient/nurse assist training, classroom-style instruction, lab training, and supply storage. 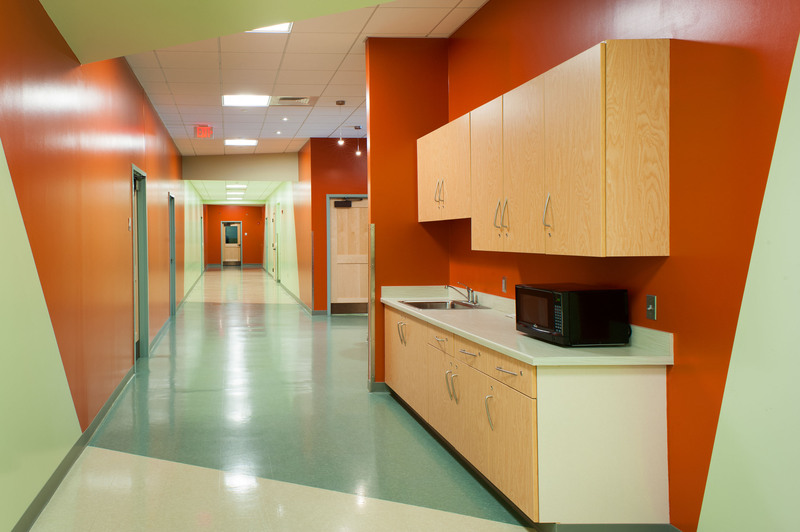 Walls are white and pristine to stimulate the sterile environment of a hospital. Lighting is energy-efficient white LED for a non-glare brightness in the room. Color is introduced in the seating to add a feeling of warmth. Interior corridors are bright and cheerful with a combination of pendant lighting from the reception area to LED lighting in the ceilings of the corridors. 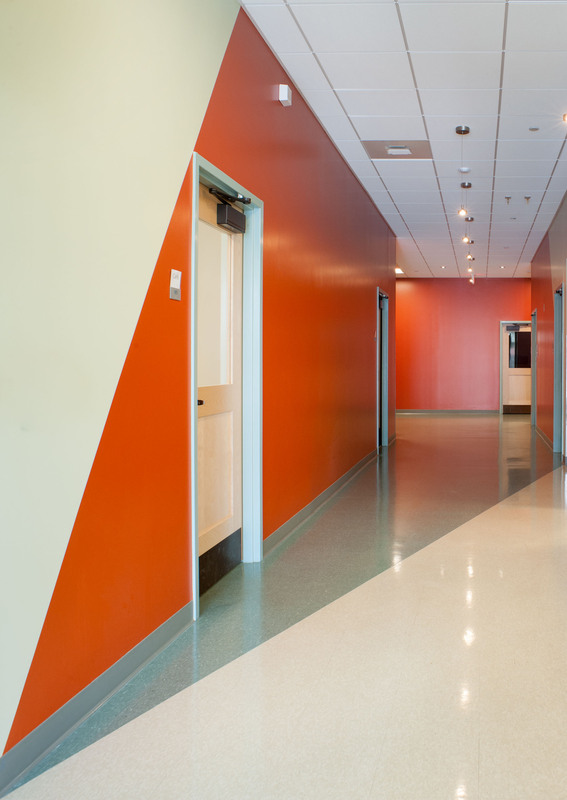 Bold colors and angular patterns in the painted walls are done with inexpensive paint and vinyl finishes that kept the design within budget while making a big design statement with interesting shapes and angles in the corridors.